It was green and hard as a Granny Smith apple when I picked it in October. It’s the last of summer. I hate to eat it. But I will. I will eat tomatoes this coming week in Los Altos, but back in Indiana I don't expect to eat another fresh one for what...maybe half a year? I won't buy the imports as a matter of principle and taste, and though I might be tempted by a locally greenhoused, hydroponically grown tomato, I can't really find the craving strong enuf to overcome my distaste with the idea of growing a food plant by dangling its roots in pea gravel and flooding it with a kool-aid of fertilizer and nutrients. Even if it's organic. Even if it's from a solar heated greenhouse. Eating each food in its season is not some cerebral ideology I adopt in an effort to buy solidarity with my fellow foodies. It's simply that this far into my life I've finally realized that keen appetite and anticipation are the better part of pleasure. Call it foreplay for the palate. 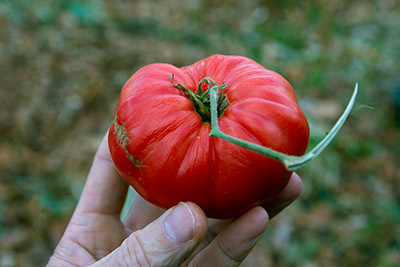 Last night I ate the last Indiana garden tomato. Next week I will eat a few of the last vine ripened tomatoes in a warmer climate. And this March I will plant tomato seeds in the basement, watch them sprout and raise their tiny leaves to the gro-lamps. In May I will bring those starts up from the basement, harden them off outdoors in the cool spring evenings, and then plant them in the warming soil. In late July I will pick the first of them.